For those of you who know me, you will already know about my interest and background in motorsport [see my profile]. 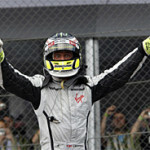 So it will come as no surprise that I am delighted to see Jenson Button claim the F1 World Championship crown. I have met Jenson a few times in the past, one of the first times was at Brands Hatch in 1998 when he won the Formula Ford Festival. This was an amazing finale to a fantastic first year of single-seater racing, especially as he also won the British Formula Ford title that same year. It was then when I could truly see that exciting things were to come from this young racer, albeit later in his career than we all expected. And, who should we bump into there…none other than ex- British Formula 1 champion, Damon Hill, who was nice enough to have his picture taken with my son, Jack. For me, a motorsport fan, this was a perfect weekend in all ways. Just a shame that when we were walking away from Damon Hill, my son asked me (quite loudly) “who was that man with the beard?” I turned around to check that Damon hadn’t heard, but he had, he turned, smiled at me then continued on his way.